There are fewer teachers I enjoy right now than Timothy Keller, pastor of Redeemer Presbyterian Church in New York City. He is brilliant, engaging and incredibly accessible. Not only did he give one of the best messages I have heard in quite a while, he has also authored two books which have very few peers. I read his first book, The Reason for God (see post), last year and was astounded at how good it was at helping people deal with the questions that usually pop up from those skeptical of God. 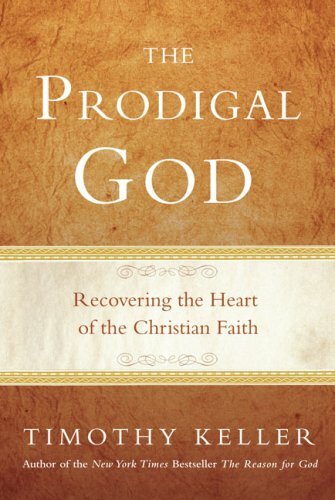 His latest book, The Prodigal God, is a book-version of his sermon series on Jesus’ parable in Luke 15 popularly known as The Prodigal Son. Of the many things that makes Keller special, what stands out is his ability to skillfully get to the core issue at hand – The Gospel. In the world that is Christianity, Inc. much of what passes as solid biblical teaching is nothing more than moralism with a little Jesus sprinkled here and there. It’s funny (in a very sad way), it seems many have left the penalty of the Law to embrace the grace offered in Jesus only to create new laws in order to make us feel better about our performance before a God who has already performed for us. Instead of letting Christianity become a freeing grace from God it gets turned into oppressive, soul-crushing religion. This won’t do and Keller is one of the best voices to help us see what a Gospel-centered life can look like. The Prodigal God is his latest attempt to bring people out of the clutches of religion into the Gospel of grace. The book is brief (only 132 pages) but totally enthralling as it breaks down the relationship a father in the Ancient Near East would have with his sons giving us a deeper appreciation not only for what truly was transpiring in the parable but also the greatness of the Gospel. I won’t say anymore. Read it for yourself. We’ve just concluded the first month of 2009 and I may have already read the best book of the year. Ok–you are making me want to read–for enjoyment! I agree. This book explains how God’s true steadfast love does truly endures forever. What a forgiving and loving God.